Writing from Bermersley, on 13 May 1843, Hugh Bourne wants to tell John Brownson that he has been restationed in Belper for another year. His ministry is clearly proving effective, or Hugh Bourne would have made sure he was removed. This letter shows that Hugh Bourne is still taking a leading role in stationing (deciding where Primitive Methodist ministers are to serve each year), for which his organisational skills proved indispensable in the early years. 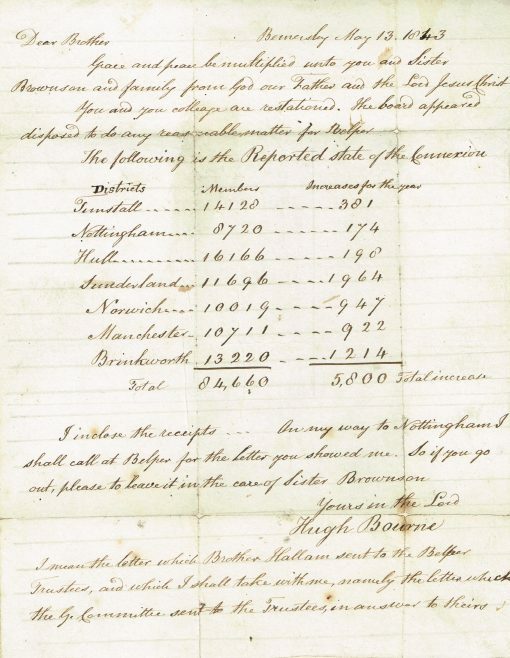 The membership statistics also show the rapid expansion that is taking place in the mining areas of the North East, as a result of William Clowes’ mission from Hull. The Sunderland District has seen an increase of 1,964 members in the year 1842-43, but Tunstall District still has the most members.